Our teddy bear lets your cutest loved one know just how cute they are! 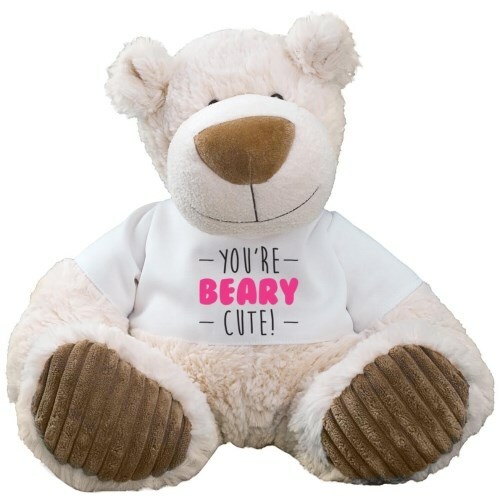 Wearing a t-shirt with our “You’re Beary Cute!” design, this teddy bear makes an excellent gift for any occasion. This fun loving design is featured on our Latte Bear who comes in two great sizes. Please choose from our 12” or our 15" tall Latte Teddy Bear. Latte features the classic Aurora plush style. Latte is a smiling bear with a modernistic, oversize nose. His cream color exterior is enjoyably soft and the corduroy pads on his plush feet offer a velvety texture. Free gift wrapping and a free gift message are also included to create a thoughtful presentation. With that adorable smile and soft, cuddly feel, Latte makes an excellent addition to any teddy bear collection. Latte measures 15” tall and features the classic Aurora plush style. Latte is a smiling bear with a modernistic, oversize nose. His cream color exterior is enjoyably soft and the corduroy pads on his plush feet offer a velvety texture. Latte wears a t-shirt that may be customized with any design and personal messages! Free personalization is included. Free Gift Wrapping and a Free Gift Card are also included to create a thoughtful presentation. Additional Details Shop all of our great Valentine's Bears and Romance stuffed animals to find the perfect plush animal for your sweetheart.